Evie and Nate Sutter are getting ready for the wedding between Nate's mom and Evie's partner at the bike shop. While going to pickup Nate's moms wedding dress she meets up with Fiona and meets the ferry landing on the island Fiona gets upset when she sees Perry someone Fiona use to know back in her days of living in California and what Evie can tell not in a good way. Doesn't take long before Perry winds up dead in the bushes of the grand hotel and Evie finds herself knee deep in oil and a dead body. What does Perry have that he's holding over Fiona? More importantly is it true? 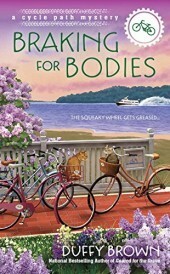 As with every Duffy Brown book she has a way of weaving humor into her mystery and this one doesn't disappoint I found myself laughing out loud more than once so much I shared the funny parts with my husband. I love her ability to weave other aspects into a mystery. Was so worth reading this series I loved it! Thank you for the amazing review!! I truly appreciate it. That you laughed out loud makes my day. Thank you!! such a great story you have an amazing ability to tell a fabulous story with everything I love about your storytelling please don't stop!!! I've read more of the consignment shop mysteries (because there are more!) but I think I love the setting of the cycle path! Thanks! I have read most of Duffy's Consignment Shop Mystery series and really enjoy her books! I'm planning on reading the rest of her books! They have me laughing out loud! The Characters are so interesting!